We were so excited to find this pasta at Matbazaren.no and decided to give it a spicy and Peruvian flavor by making a rocoto cheese sauce. If you can't find Peruvian rocoto, you can use another red chili sauce. Salt and pepper the fish and let it rest. Bring water to boil with some salt and oil. Heat another pan with some oil. Add feta cheese in a blender and add some chili until desired spiciness. Then add about 2 dl heavy cream or until the consistency is like a sauce. The pan should be warm now and the water boiling. Add the pasta to the water and fry the fish very lightly in the pan. The inside should still be raw. Place pasta on the plate, pour on the sauce, top with the trout and garnish with fresh dill and red pepper. Christmasy steambun with rib and red chaucroute (the latter Hitchhiker receieved from Strand Restaurant as Christmas present this year). When Hitchhiker first opened its doors in April this year, Anders went there seven times in the opening weeks because he loved it so much. Finally, Oslo had a Mekka for street food with inspiration from all over the world! Like a child growing up, Hitchhiker has had its challenges, and during the summer and early autumn we saw it go through a pretty rough puberty. However, now it seems Hitchhiker is back! Back on track - back to the origin of simple and good flavors. We tested the whole tasting menu, and one of the lunch options, together with Fredrik, Marius and Anders. Porchetta. Slow cooked rib roll with gremolata, in Hawaiian bread with red cabbage and mustard aioli. This was not on the tasting menu, in fact it was on the lunch menu, but we arrived early to taste it. Monkfish sashimi with kimchi sesam, warm nut butter, acidic soy sauce and chedere from Palermo. The chedere was an amazing citrus fruit where you could eat the white part. Stian explains us about the chedere fruit from Palermo. Potatoe and bacon waffle with "rakfisk" from Noraker gård, sour cream from Røros and watercress. Cripsy softshell crab with black cabbage from Toten, lemon mayo and power goya. Hot fried chicken drumsticks with a crab and "løyrom" sauce. Hitchchicks/Hitchsticks are chicken drumsticks done right! Gyoza with rib, shrimps and kale. Okonomiyaki; Japanese pancake. Okonomi means "what you like" and yak means "grilled". This one had cabbage, rib, wasabi mayo and tempura fritter. This was one of the highlights on the menu! Smokey grilled veggy enchiladas and avocado. Our least favorite from all dishes, but still quite good. Optional dessert! A little piece of heaven. Fried cannoli filled with fresh cream cheese. It even had some popping candy in there. HOMG! Anders was gone so this was my super quick dinner for one the other night. A perfect leftover meal. In a hot pan fry the shrimps for no more than tree minutes - otherwise they get hard and chewy. Serve with some fresh herbs sprinkles . We passed by Youngstorget this Saturday, and found a friendly German named Moritz Drechsel selling his chocolate truffles which he calls Berliner Böller. The truffles are handmade, uses Valhrona chocolate and has no conservants. Moritz makes only a small amount of these each year, around 5000. We had actually met Moritz before, we realised, at the "Mat uten grenser" food festival this summer. Back then we thought we were going to save the truffles for desserts, but by the time we got back to the stand he was sold out. This time we would not do the same mistake and bought three big bags. The truffles comes in many flavors; passion fruit, cocoa, lemongrass, raspberries, nougat, milk chocolate, caramel, orange and mochaccino to name a few. You can order them through the facebook page Berliner Böller or go down to Youngstorget again next Saturday from 10am until sold out. Moritz accepts both card and cash and you get 10 pieces for NOK 119. Finale Show of "På Nye Veier - 100% Veimat"
We got an invite to the finale show of "På nye veier - 100 % veimat" at Sentrum Scene the 5th of December. This has been a project from Esso to make a new and improved dish to serve at their gas stations all around the country. Arne Brimi was the head chef of the project. Heine Totland hosted the evening and four of our favorite chef friends from Smalhans and Hitchhiker were on the competing teams; Black Rose, Bart & Skank and Beat of the Street. Thanks Astrid for the tickets. Enjoy the photos from the show and the food we tasted. Anders in serious conversation about the "Reinbabb" with Jon Marius from Smalhans. The singing sheep man sang "Please don't eat me now", representing the winning dish "Pinnekjøttrull". 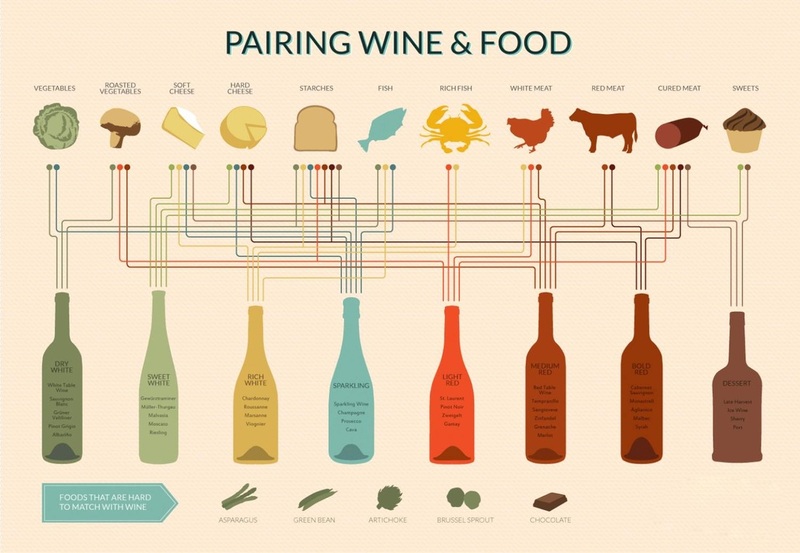 Even though I work at a Wine Bar and we both love to try different wines, sometimes we have some difficulties pairing wine with food. I found this very useful infographic about it, and I thought this must be a good thing to share with you. Every time we visit Gutta på Haugen we hear Joachim talking about the amazing artichokes from La Baita, like they were made of pure gold. So we decided to try these Italian delicacies from the region of Albenga. We figured we'd keep it Italian style and make a risotto. Weekend means we have been shopping at Gutta på Haugen again! This time we got some sweet Pomodoros Marzano in a jar from San Nicola dei Miri and Spaghetti from Martelli. Much cheaper than a flight to Italy. Andrea wanted just a simple Pasta Napoletana, but I managed to get my will and add some meatballs luckily. This is a quick meal if you focus! Soak the bread in the milk for a few minutes. Meanwhile, chop everything else for the meatballs. Squeeze the milk out of the bread. Mix all the ingredients for the meatballs. Now, get your hands in there. Really mix it well together. When you are happy with your meatball dough place it in the fridge for 10-15 minutes. Meanwhile you can chop and prepare everything for the sauce, and put some water to boil for the pasta. Heat the pan to medium-high and add a mix of olive oil and butter. Make meatballs in the size and shape you want using the palm of your hand (with some olive oil) and a tablespoon that you rinse in hot water in-between each meatball. Don't fry too many meatballs at the same time, give them some space in the pan. Keep flipping them around until all sides are browned and you feel certain they are warm to the core. I estimate 8-10 minutes for the size in the pictures. Add salt and oil to the boiling water and cook the pasta. Set the fried meatballs aside, and cover them with some aluminum foil. Don't throw away the oil and butter you fried the meatballs in! This will be the base for your sauce. Add some more oil if you need to and fry the shallot and garlic on medium temperature. When the onion gets a blank color, add the remaining ingredients for the sauce. After 5 minutes use a stab mixer to puree it, and then return the sauce to the pan. Once the pasta is cooked, drain it, but use some of the pasta water in the sauce to get the desired consistency. Mix olive oil into the spaghetti so it doesn't get sticky. If needed you can reheat the meatballs in the sauce for a few minutes. Pasta, sauce, meatballs on top. Presto!